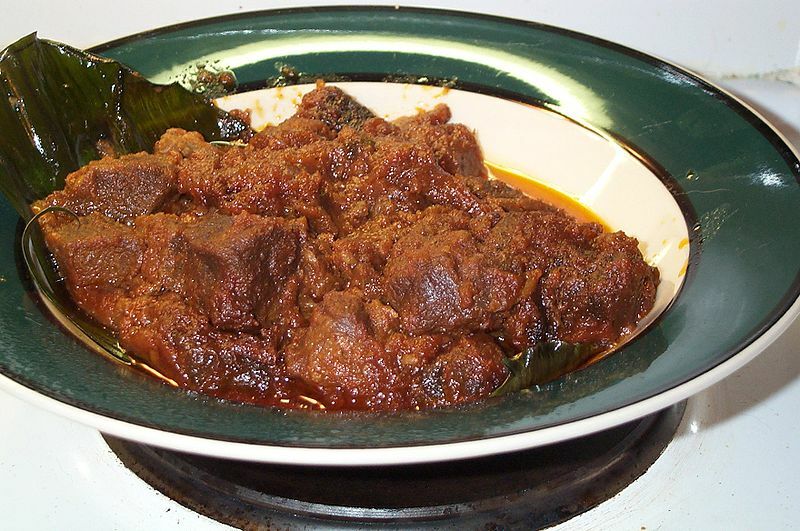 Rendang is a dish which originated from the Minangkabau ethnic group of Indonesia, and is now commonly served across the country. One of the characteristic foods of Minangkabau culture, it is served at ceremonial occasions and to honour guests. Also popular in Malaysia and Singapore, rendang is traditionally prepared by the Malay community during festive occasions. Though rendang is sometimes described as being like a curry, and the name is sometimes applied to curried meat dishes in Malaysia, authentic rendang is nothing like a curry. Rendang is made from beef (or occasionally chicken, mutton, water buffalo, duck, or vegetables like jackfruit or cassava) slowly cooked in coconut milk and spices for several hours until almost all the liquid is gone, allowing the meat to absorb the spicy condiments. The cooking process changes from boiling to frying as the liquid evaporates. The slow cooking process allows the meat to absorb all the spices and to become tender. The spices may include ginger, galangal, turmeric leaf, lemon grass and chillies. Chicken or duck rendang also contains tamarind and is usually not cooked for as long as beef rendang.